The goal was absolutely rapturous. Suso just stopped, miles outside of the box, and took a shot that no one but him believed… until it hit the underside of the bar in the right corner, well out of Bizzarri’s reach and wildest dreams… and went in. A rocket blasted from the foot of the man whose position was nearly made extinct under Montella, despite now having six goals in Serie A, the most league goals of any Milan player. With that incredible goal came a poignant reminder that, while Milan are a team, we must always make room for Suso. We knew this would be an epic battle. Two World Cup winning coaches and former Milan teammates, too, facing off with the teams they took over within a week of each other in November. Bonaventura’s shot on goal in the first minute set the tone for the match. And Suso’s earth-shattering goal in the ninth minute had even the Udinese fans applauding. 1-0 Milan. But the battle ensued, and it was a good one. Lasagna was the point person for many of Udinese’s swift counter attacks, and Gigio had to play hero again and again. Andre Silva, finally getting a start in the league, was always just out of reach of the crosses played into him. The first half was quick and both teams played well, but the second half became an even bigger and tougher battle. 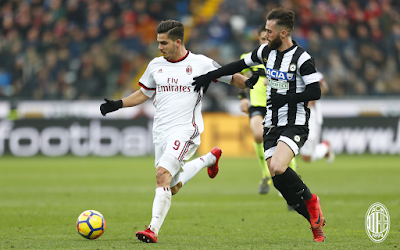 Manganiello made some interesting choices, choosing not to card Lasagna for diving when he fell in the box early in the second half, flanked by Bonucci & Abate. A VAR review showed no contact, but he wasn’t carded, either. But then again, an Abate handball went un-carded, too, so these things do work out in the long run. The big event of the second half was Calabria’s second yellow card in the 68 th. Both fouls were silly, and it was obvious that he felt the weight of his actions as he left the pitch uncontested. 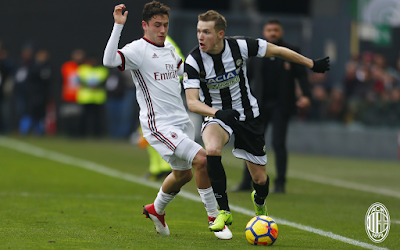 But unfortunately, in a match that was back and forth the whole game, Milan going down to ten men changed the balance. So it’s no surprise that the assault on Gigio ensued. And after many brilliant and heroic saves, in the 76 th, he ended up the victim of a Lasagna shot that deflected off of Bonucci and thus hit the back of his shoulder, ending up an own goal. 1-1 all. At least technically, though, we kept Lasagna off the scoreboard. It didn’t help my nausea, though. Gattuso finally gave up on Silva and replaced him with Kalinic in the 72 nd, but he wasn’t enough. 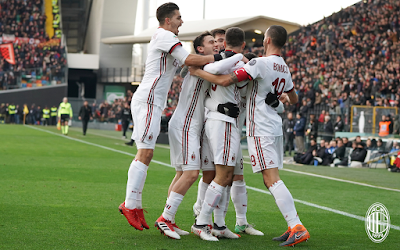 Milan fought to the bitter end, including a Suso free kick straight into the wall in the 91 st followed by a Kalinic header that went over. When the whistle blew at full time, it was hard to believe we hadn’t won, our guys fought so valiantly. 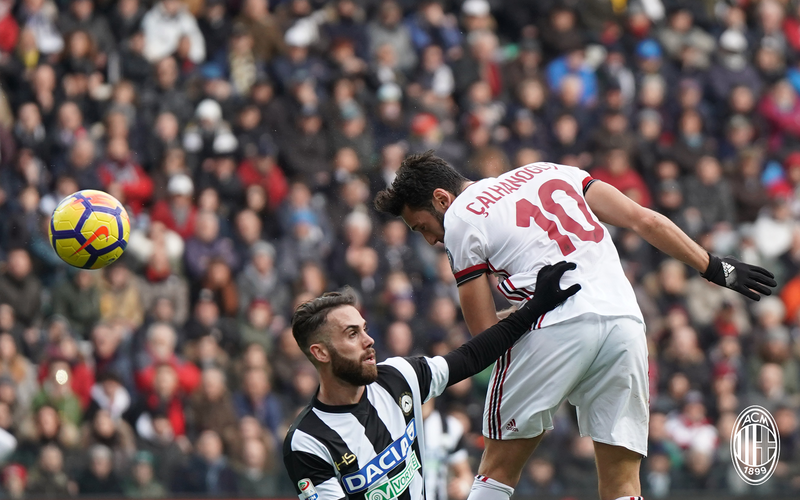 And even if Calabria’s sending off absolutely upset the balance and likely cost us the other two points, credit to Udinese for playing an intense and well-fought match. Despite the red card and the own goal and other moments of shame, my mind and my heart keep going back to that ninth minute goal. People keep saying how predictable Suso is, but he still scores, even when opponents know exactly what he’s going to do. He creates, he sees things that our other attackers don’t seem to, and he takes chances and shots that no one else would. Maybe he’s lucky enough to have been at Milan longer and to feel grounded, but at this point in our rebuilding, he’s absolutely essential. If there’s one thing I learned from this game, it’s that we must always, always, always make room for Suso.